We conduct CBT in Portsmouth every day of the year except Christmas and New Year. Our CBT courses consist of high quality and well structured training systems. Training begins in a classroom and progresses to one of our off-road sites for maintenance and controls training. There is some additional classroom training before the 2-hour road ride. The length of the course depends upon the progress and previous experience of each pupil. You can normally expect to spend at least 5 hours with us for your CBT. Although there is no theory test for CBT, we strongly recommend a study of the highway code in preparation. 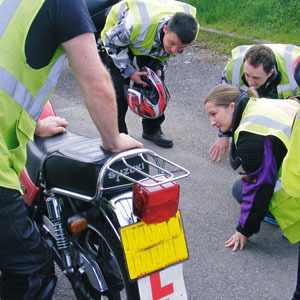 CBT allows 16 year-olds to ride mopeds, and 17+ year olds to ride 125cc machines as learners. 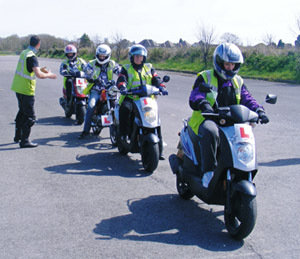 In order to complete a CBT you must have a provisional motorcycle (category A) or moped (category p or AM) license. All motorcycle riders without a full motorcycle license MUST complete a CBT in order to ride on the road, all moped riders must complete a CBT, unless you have passed your car driving test before February 1st 2001. Any vehicle up to a maximum 50cc engine capacity. These must be restricted to a maximum speed of 31mph on a category "p" license, and 28mph on a category "AM" license. This is a motorcycle up to 125cc, and must not have a power of more than 14.6 bhp. You MUST NOT carry a passenger. You have to pass your full license to remove these restrictions. Click here for more info. Please contact us for more information or to book your course.